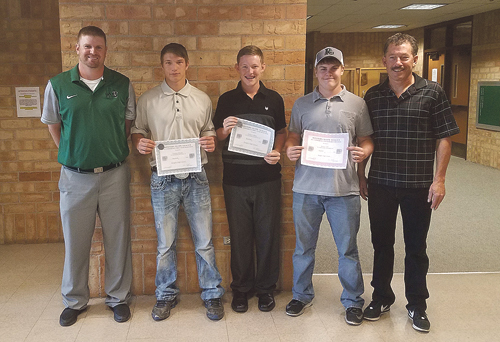 Four RHS baseball team members were honored for their excellence on the ball field this season. Head coach Jeremy Lohry (left) with Tristan Moore and Dylan LeBleu, who were named to first team all-conference. Stetson Cudo and Drew Brannan (not pictured) received all-conference honorable mention. Assistant coach Jerry LeBleu is at right.